Red Cross cow, a feature of Wagga Wagga Show, 1917. From NRS 4481 MS5387. Red Cross stall, April 1918. From NRS 4481, image ST6216. School children display of Australia with Red Cross in centre, July 1915. From NRS 4481 ST5705. Within two weeks of the outbreak of World War I the Australian Branch of the British Red Cross Society (commonly known as the Australian Red Cross Society) became established in cities and country towns across Australia. [Fig. 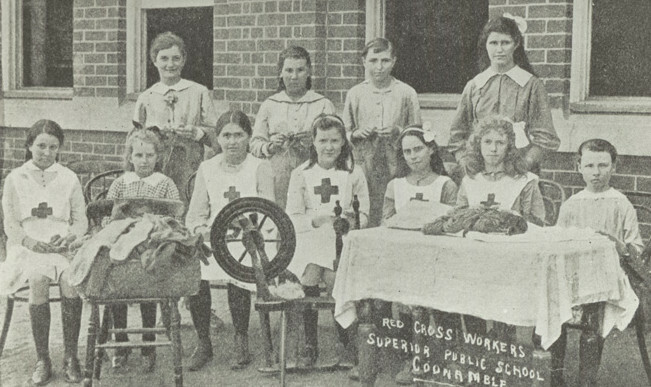 2] Red Cross workers at Coonamble Public School knitting and spinning, 1918. From NRS 15051. From the start of the war the Red Cross successfully sewed, knitted, fundraised and collected donations to support wounded soldiers. [Fig. 2] As the war continued Red Cross activities expanded to meet wartime demands. These new activities included the founding of the Junior Red Cross, the Wounded and Missing Enquiry Bureau, the Prisoner of War Department and the Voluntary Aid Detachments. As news of the Gallipoli campaign filtered back to Australia, many families wanted more details about what had happened to their loved ones. In October 1915 Vera Deakin arrived in Cairo to establish the Wounded and Missing Enquiry Bureau for the Australian Red Cross. [Fig. 3] Relief of Australian Prisoners of War, includes Red Cross Report. From NRS 12060 [9/4724] letter 16/5171. [Fig. 4] Red Cross Report on visit to France and Switzerland in connection with Australian Prisoners of war. From NRS 12060 [9/4724] letter 16/5171, p.1. [Fig. 5] Red Cross Report on visit to France and Switzerland in connection with Australian Prisoners of war. From NRS 12060 [9/4724] letter 16/5171, p.2. [Fig. 6] Red Cross Report on visit to France and Switzerland in connection with Australian Prisoners of war. From NRS 12060 [9/4724] letter 16/5171, p.3. [Fig. 7] Red Cross Report on visit to France and Switzerland in connection with Australian Prisoners of war. From NRS 12060 [9/4724] letter 16/5171, p.4. [Fig. 8] Red Cross Report on visit to France and Switzerland in connection with Australian Prisoners of war. From NRS 12060 [9/4724] letter 16/5171, p.5. [Fig. 9] Red Cross Report on visit to France and Switzerland in connection with Australian Prisoners of war. From NRS 12060 [9/4724] letter 16/5171, p.6. In 1915 the Australian Red Cross established a new initiative, the Voluntary Aid Detachments (or VAD). The Australia-wide scheme provided basic first aid training (supplied by the St John Ambulance Service) to about 10,000 women volunteers, known as a VA. (13) After the VA had attended a first aid course and completed a month long stint at a major hospital, such as Sydney Hospital, they could begin their work. VAs could work in Red Cross convalescent and nursing homes as nursing orderlies, carrying out menial tasks such as rolling bandages, cleaning floor or feeding patients. (14) VAs also worked as unpaid helpers in places such as the Anzac Buffet in Hyde Park Sydney, the Red Cross Pickle Depot, the Red Cross Jam Factory and the Red Cross Fruit and Vegetable Depot in Sydney. In September 1916 Australian VAD workers were allowed to serve overseas for the first time. They were recognised as auxiliaries to the medical service and soon began working in military hospitals. This success was a practical contribution from the home front to meet wartime demands. Following the conclusion of the war the enormous work of the Australian Red Cross Society was recognised and the popularity of the group continued in peace time. For more details regarding the Australian Red Cross Society Wounded and Missing Enquiry Bureau case files contact the Australian War Memorial. The case files have been digitised and can be searched online. For more details regarding the Australian Red Cross Society Prisoner of War case files contact the Australian War Memorial. Australian Red Cross Prisoner of War files have not been digitised but can be viewed in the Australian War Memorial research centre. 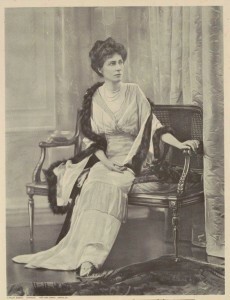 (1) Oppenheimer, Melanie, “Lady Helen Munro Ferguson and the Australian Red Cross: Vice-regal Leader and Internationalist in the Early twentieth century”, The Australian Women’s Register, http://www.womenaustralia.info/leaders/fff/pdfs/ferguson.pdf, accessed on 30 November 2015, pp280-81. (2) “Red Cross, Lady Mayoress’s appeal to the people”, Sydney Morning Herald, 14 August 1914, p.10, http://trove.nla.gov.au/ndp/del/article/15529609, accessed 22 Dec 2015. (3) Suter, Keith, “Australian Red Cross Society”, Global Directions, http://www.global-directions.com/Articles/Peace%20and%20Conflict/AustralianRedCross.pdf, accessed on 13 January 2016. (4) Willis, Ian, “Doing their bit: The Red Cross on the New South Wales Homefront during the First World War”, History: Magazine of the Royal Australian Historical Society, March 2015, No. 123, pp 3-5. (5) Scott, Ernest, Official History of Australia in the War of 1914-18, Vol. XI, 7th Ed., 1941 (Ch XXI), https://www.awm.gov.au/collection/RCDIG1069950/, accessed 30 November 2015, p.703. (7) Oppenheimer, “Lady Helen”, p.282. (8) Campbell, Annie, “…thousands of tiny fingers moving – The beginning of the Junior Red Cross movement in New South Wales, 1914-1928”, Journal of the Royal Australian Historical Society, Vol. 90, Issue 2, December 2004. (9) Oppenheimer, Melanie, Australian Women and War, Canberra, Department of Veterans’ Affairs, 2008, p.42; Campbell, p.188. (11) State Archives New South Wales: Premier’s Department; NRS 12060, Letters received [9/4724] letter 16/5171. (14) Oppenheimer, Melanie, Red Cross VAs: A History of the VAD Movement in NSW, Walcha, Ohio Productions, 1999, p.149.